Hot and humid weather make my hair frizzy and at the same time I have hair fall concern too. 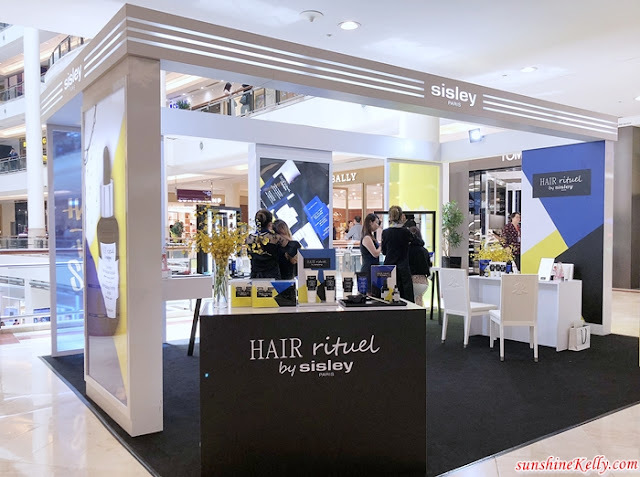 So recently I tried out the newly launched Hair Rituel By SISLEY haircare range that can treat both scalp and hair fibre formulated with high concentrations of powerful plant-based active ingredients. When Haircare is new Skincare, the new Hair Rituel By SISLEY is an effective, sensorial, complete hair care routine to clean, regenerate, fortify, and beautify hair every day. Hair Rituel By SISLEY is a simple ritual, short product line, essential treatment that does not contains any harmful chemical. The shampoo is sulphate-free and enriched with ultra-soft surfactants. The haircare range consist of 6 products such as Revitalizing Volumizing Shampoo, Revitalizing Smoothing Shampoo, Restructuring Conditioner, Regenerating Hair Care Mask, Revitalizing Fortifying Serum and Precious Hair Care Oil. The first step in the ritual, Revitalizing Volumizing Shampoo gently cleans the hair and provides the vitamins and minerals needed for scalp and hair vitality. Brimming with active hair care ingredients, it immediately provides tone and volume to the hair. This is for the unruly and frizzy hair, it is enriched with active hair care ingredients, Revitalizing Smoothing Shampoo delicately cleans the hair, nourishing, coating, and disciplining untameable hair with each wash. Hair is shinier and smoother; suppleness is restored. The Restructuring Conditioner complements the shampoo, coating the hair to smooth its cuticle, increase shine, and improve resistance. Its melting texture makes it extremely easy and pleasant to apply. A true emergency treatment that acts on both scalp and hair lengths, the Regenerating Hair Care Mask repairs devitalised, sensitised hair. With a very high concentration of plant extracts, proteins, vitamins, and minerals, the formula energises the hair bulb to reinforce hair vigour from the root. The beneficial combination of emergency treatment oils (Shea, Macadamia, Camellia, and Hazelnut) smooths and nourishes the hair fibre without weighing it down. Revitalizing Fortifying Serum is the STAR product of this range. This is for the scalp, treat hair starts from its root. It makes the hair stronger and denser. The Revitalizing Fortifying Serum truly boosts energy in the scalp to fortify the hair. It can be applied to dry or damp hair, part by part (three dropperfuls on the scalp), then massaged with the fingertips, particularly in areas where hair is falling out. This truly intensive course of treatment is to be used every other day for one month, then twice weekly for two months for maintenance. Revitalizing Fortifying Serum immediately soothes sensations of discomfort and adds volume to the hair. This Precious Hair Care Oil is the last step in the care ritual, applying the oil primes the hair for styling. This is for hair not for scalp. It is also the perfect way to add a touch of radiance during the day. Its fragrance gives your hair a delightful scent that lasts all day, and its light texture leaves behind a silky veil. After application, the hair is visibly shinier. Hair Rituel By SISLEY haircare range is giving a sensorial experience and leaving luxurious feeling. This a daily hair care for home usage that effectively restore our hair moisture, strengthen hair fibre and revitalize the scalp.